(Nanowerk News) Nowadays, a myriad of silicon transistors are responsible to pass on the information on a microchip. The transistors are arranged in a planar array, i.e. lying flat next to each other, and have shrunk down already to a size of only about 50 nanometers (1 nanometer = 1 millionth part of 1 millimeter). Further miniaturization of transistors with a planar structure will soon come to an end due to fundamental physical limits. Still, even smaller transistors are desirable in order to continuously improve their functions while reducing the cost of the electronics. Scheme of a silicon wafer with novel vertical transistors made out of silicon nanowires. The Max Planck researchers in Halle produce monocrystalline silicon nanowires which are particularly suitable as components for microchips. At the FZD’s ion beam center, foreign atoms known as ‘dopants’ are implanted into the nanowires. The dopants occupy lattice sites of the host semiconductor increasing the electrical conductivity and the current flow through the semiconductor. Selective implantation of different dopants can change the polarity of the charge carriers in a transistor leading to the switching of the current flow. The planar silicon technology is well developed; however, this is not true for silicon nanostructures. “First, we analyzed wires with a diameter of 100 nanometers and 300 nanometers in length. But what we aim at are wires with a diameter of a few atoms only, as well as wires where individual atoms are strung together. We intend to closely characterize their behavior in materials and want to find out how their electrical properties can be tailored for application in nanoelectronics, e.g. 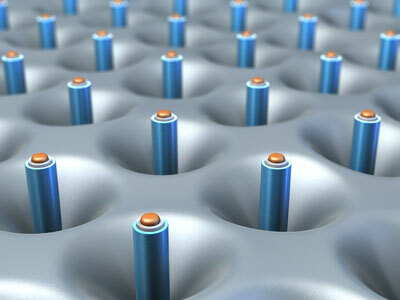 for new field-effect transistors,” say FZD physicists Dr. Reinhard Koegler and Dr. Xin Ou. The nanowires were investigated in Rossendorf using a technique (Scanning Spreading Resistance Microscopy, SSRM) that usually measures the position- dependent electrical resistivity in a specially-prepared two-dimensional cross-section of the nanowire ("Carrier Profiling of Individual Si Nanowires by Scanning Spreading Resistance Microscopy"). The resistivity is related to the atomic concentration of the dopants. In the current work, the researchers have found that the dopants in a silicon nanowire, namely boron and phorphorus, do not stay where they are expected, but drift to the surface of the nanowire where they become partially inactive and can no longer contribute to the electrical conductivity. Up until now scientists were lacking an appropriate technique to visualize and quantify the consequences of an unequal distribution of dopants at the nanoscale. Chip designers have to pay attention to the newly found results if nanowires are to be applied for vertical transistors in the future.